If you’re already a certified diver the friendly Werner Lau Dive Centre team can kit you out with equipment and then you’re free to dive the house reef with your buddy at your leisure, or if you’re a novice you can learn to dive with us. Perhaps you want to expand your experience, skills and knowledge with a diving course, taking you to the next level of certification. Bathala offers a comprehensive range of SSI, CMAS and PADI courses for all levels, from beginners courses right up to divemaster level. There are also daily dive boat excursions to the incredible dive spots across Ari Atoll. Bathala itself is a charming and lush tropical island, to which guests keep coming back year after year. 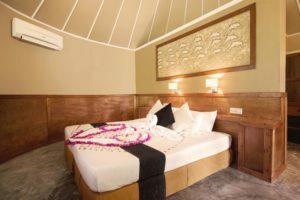 This rustic resort harks back to the early days of tourism in the Maldives when adventurous travellers could revel in the natural beauty of their surroundings without the desire for the latest high-tech gadgets. Today as it was then, Bathala is an unfussy, laid-back, affordable retreat which offers excellent value for money. Simple villas open out onto a powdery white sand beach and glorious turquoise vista. Within seconds you can be in the crystal clear water surrounded by shoals of reef fish, sharks and turtles. 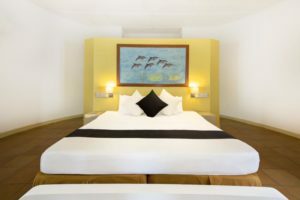 Standard Beach Room Room size: 35 m2/377ft Features: Shower, Hair dryer, Toiletries, Towels, Air conditioning, Mini bar. Superior Beachfront Bungalow Room size: 45 m2/484ft2 Features: Shower, Hair dryer, Toiletries, Towels, Air conditioning, Mini bar.